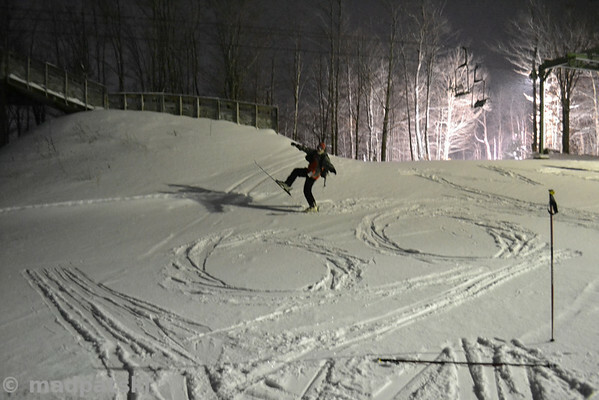 Someone asked how I was going to do when I reached "100"...how about skiing and fireworks? Celebrating the New Year in New York!!! Not TIMES Square at the centre of Manhattan, but TITUS Mountain on the Northern edge of the Adirondack mountains a few miles south of the Whippleville near Malone, New York. In the last days of 2013 I received an email from Titus informing me of their plans. I thought it would so cool. 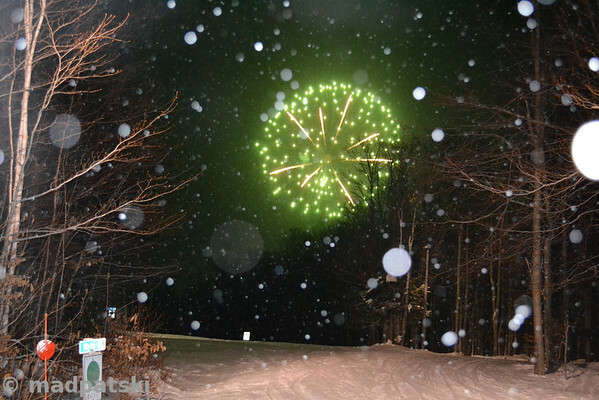 I had skied a number of times on the first day on New Year, but never at the stroke of midnight. It was something that I had looked for New Year 2000, but I didn’t find. Now we were going into 2014 and a family ski area few miles south of the border was going to make it happen. The month of January 2014 was also a personal skiing milestone for myself. Happy New Year to all my friends on FTO!!! Have a great season and stay healthy. 100 months!!! Great job Pat.I hope you can keep it going. In honour of this momentous occasion, I'm not going to make a "tail wagging the dog" comment. lono wrote: 100 months!!! Great job Pat.I hope you can keep it going. Yes, I can unto skiing into February & March. I got a pass and a few vouchers, I need to take advantage of them. There are a few objectives for this season, all related to 100. - 100 ski areas visited uniquely in the ski streak years. Titus was ski area 88th. - This one is going to be the hardest and is a long shot...100 ski days which would be 53% more than my previous record of 65 days. I'm on record pace for beating 65, but I need to keep it going. However this goal is the hardest. Before the ski streak is over, I would like to be able to ski in every continents (minus Antarctica) in the streak years. I'm missing 3. I've been struggling to ski this season for health reasons, for example I couldn't get myself on the slopes for 1st Masters race of the season. Patrick wrote: However this goal is the hardest. Before the ski streak is over, I would like to be able to ski in every continents (minus Antarctica) in the streak years. I'm missing 3. Sorry, since 2009 Antarctica is feasible. There was an Ice Axe cruise in 2013, and they are scheduled for 2014 and 2015. You want the continents, there are 7. I'm still one continent short. Patrick wrote: 100 ski days which would be 53% more than my previous record of 65 days. You need an banner year in your own back yard for that, as demonstrated by admin in 2011. FYI Garry Klassen lives about as close to Baldy as you do the the Ottawa molehills, and he skied 86 days at Baldy in 2004-05. The way thinks have been going, my records of 72 in 2010-11 (or 80 within 365 days) look like they are going to hold up for awhile. Patrick wrote: - 100 ski areas visited uniquely in the ski streak years. The ski area count is of course one of my key objectives. I added 4 small areas on the recent trip to get to 186. 200 is not too many seasons away I hope. I'd love to go for 7, but that last one within the ski streak years has a huge pricetag considering my financial situation for the next few seasons. 6 is more realistic for the moment. You need an banner year in your own back yard for that, as demonstrated by admin in 2011. A few personal records will fall this season. Greatest amount of days in one month (16) and in December (8) fell with 17 last month. I'm up to 17 outings at Edelweiss: record is 27 at one area (also Edelweiss). Remember both Ottawa skiers, which were also patrols on the side, that were with me in Portillo in 2007? They were both in the 110 range. So far, I'm ahead in day counts on all my previous years...that being said, I haven't skied since last Sunday. The earliest 23rd day of the season prior to this year has been on January 29 compared to January 5th this year. 100 is really ambition considering that I'm still far from being 100%. Of course, if I count the ski areas I've skied since I started keeping track, the count is currently at 127 (potentially 135 lifetime). I haven't skied in the ski streak year Kmart and until this season, Titus. So 88 in 100 months is pretty diversified. Objective is 12 more to get to this season, but I won't go picking off the easy ones (which I haven't skied in 20 years) in the Laurentians just for that sake.